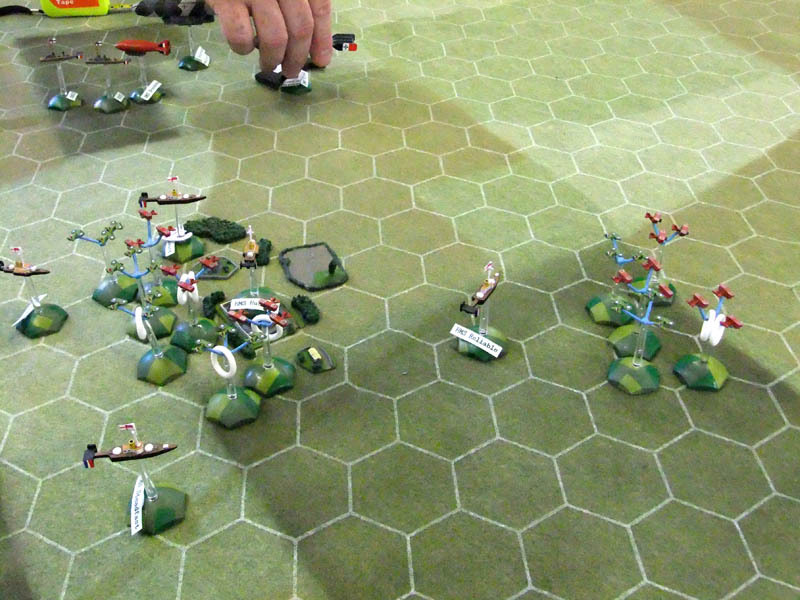 Well finally I managed an Aeronef game with my heavily altered Aeronef rules … The result was a success albeit I noticed a couple of things that could be improved. 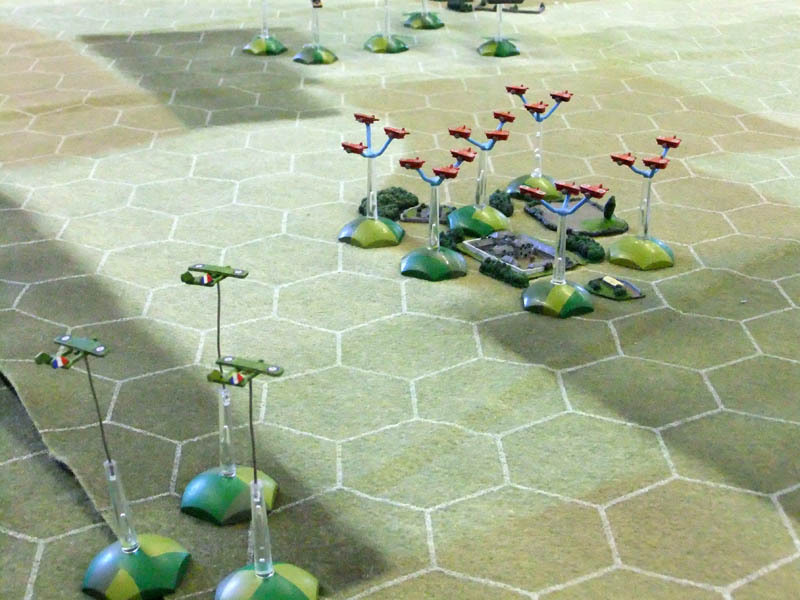 Before I head off into the Battle Report let’s just take a quick look at the rules changes. My objective was to add a little variety whilst keeping the game simple; a difficult task, but in the end the following general changes were made. Dice: System uses a D10 instead of a D6. 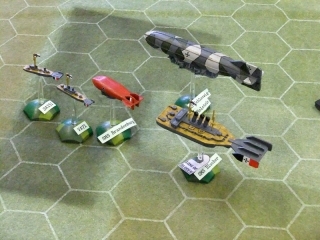 Weapons: now divided between heavy and light guns to give the large ships a little more range with a little more punch. Measurement: All in inches. Movement converted as roughly 2.5cm =1″. Ranges adjusted, maximum range for heavy guns is 36″, light guns 24″. 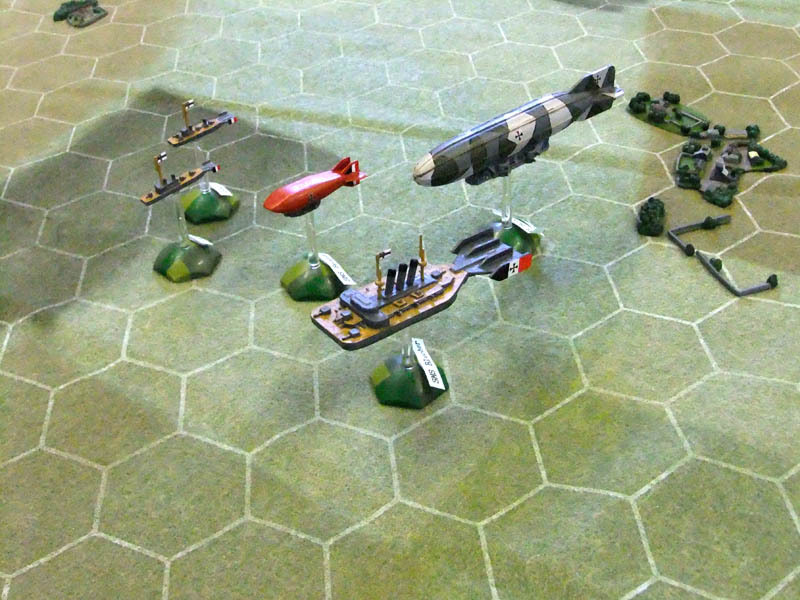 Combat Mechanics: ships roll to hit first needing 7+ (with a very small number of die roll modifiers, the main one being -1 for long range), and then damage is rolled on a damage table cross referencing die score vs weapon type. 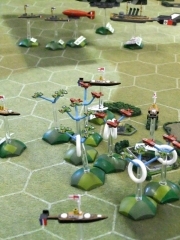 Aeroplane combat: Complete overhaul but keeping a 7+ to hit mechanic and damage table. Various other tweaks and clarifications. I wrote an 18p document for the new rules but essentially they play off 3 sheets, 1 for the sequence of play, 1 for the To Hit and Damage Tables and 1 for the Special Damage Table. 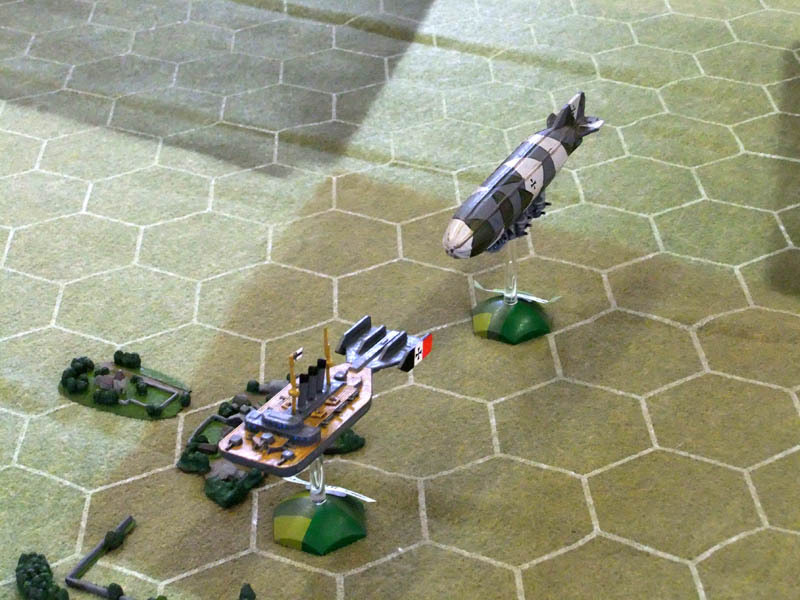 For the Germans this was a momentous occasion, the launch of their latest Aeronef Battleship, brimming with the latest technological advances known to the civilised world. Indeed the mention of the name SMS Blucher would soon strike fear into the hearts of Germany’s enemies. 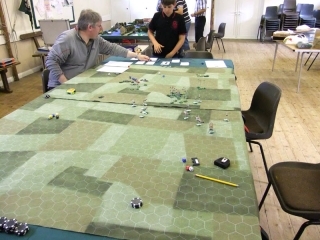 So important was this day that the Kaiser himself had decided to attend at the last minute and Admiral Baron von “Kevin” assisted by Herr “Matthew” had quickly to organise a grander event than was originally intended. The British secret agents had been very busy and discovered the launch date for the Blucher as well as the location of a nearby Mustard Gas Factory and Airfield. Using this information a strike force was put together and a daring attack planned. The British assumed (incorrectly) that the Blucher would not be fitted out completely and consequently provide an easy target. In addition the Kaiser’s visit had increased security meaning that the British would be in for a bit of a fight. Players each received a set of themed orders and a list of available assets. 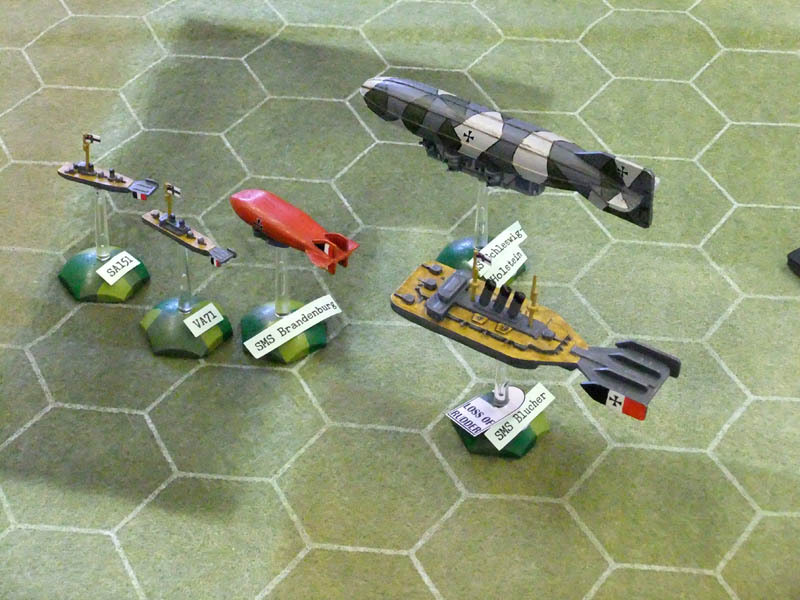 The Germans started with the Blucher and a class 1 dirigable at the dockyard whilst a couple of auxiliary patrol vessels could be placed on the German half of the table. 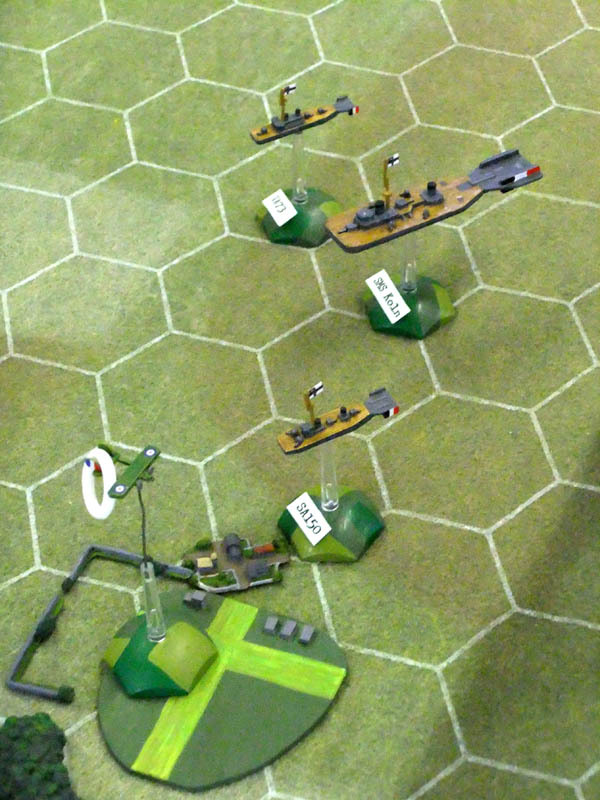 The other German forces formed 2 patrols that were available from turn 4 and 6, as long as a successful 7+ roll was made. 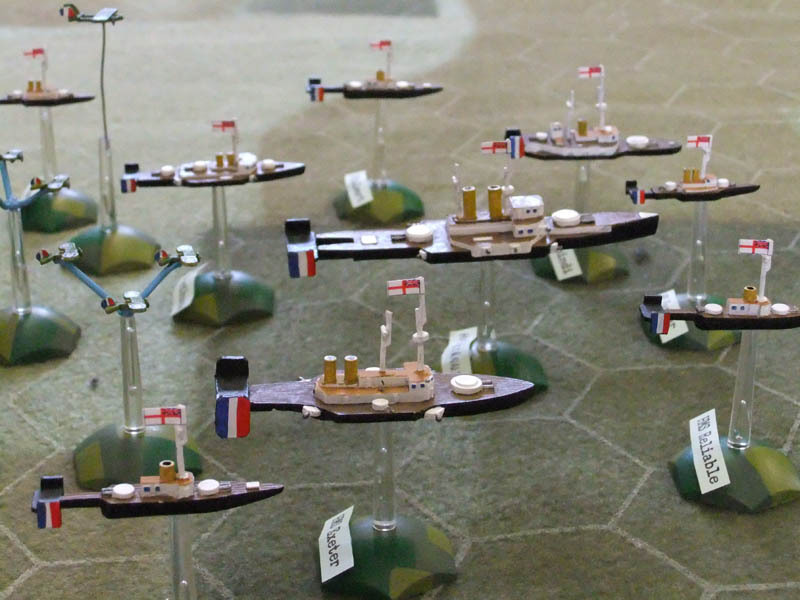 Meanwhile the British had their entire strike force available available on turn one, a force that included, the carrier HMS Albion, the Battleship HMS Britannia, a torpedo nef, 3 fixed wing bombers and a multitude of support vessels. The disposition of the forces equidistant from the Secret Mustard Gas Factory meant that the German forces would have to choose to contest the facility or withdraw and leave it to its fate. Retreat is not in the Geman dictionary (They call it Rückzug) so the SMS Blucher and SMS Schleswig-Holstein powered up thier engines and lumbered forward. Fighters from the nearby Ulmgarte Air base were scrambled and sent forward to the factory. The British pushed thier main force ahead towards the factory but issued orders to a light squadron led by HMS Rawalpindi to intercept and delay the Blucher. 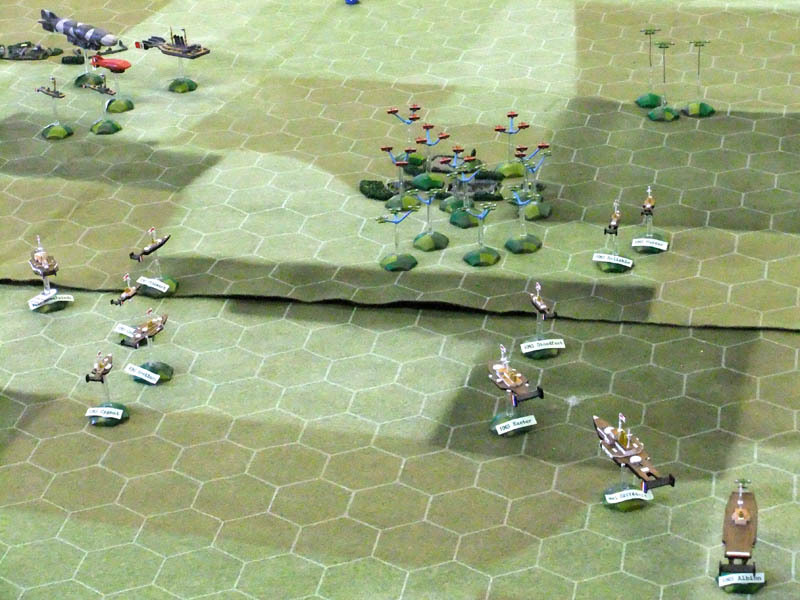 Initially the first shots saw the Rawalpindi ravaged by heavy fire from the Bluchers guns but with German support not arriving until turn 6 the British concentrated all fire on the Blucher which proved a tough nut to crack. 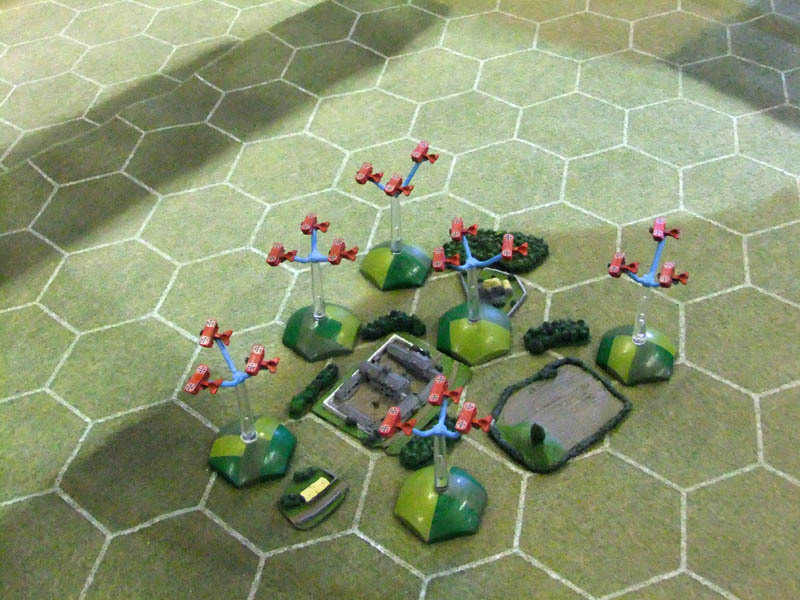 Fighters and Bombers contested the skies over the factory with the Germans fairing best despite heavy casualties. The British Bombers choose to leave the fighters to it and flew further South to make an attack on the undefended airfield. Weight of numbers told in the end and a nef managed to bomb the target scoring an unfeasable number of re-rolls on it’s damage dice thus reducing the site to rubble, and of course gas. 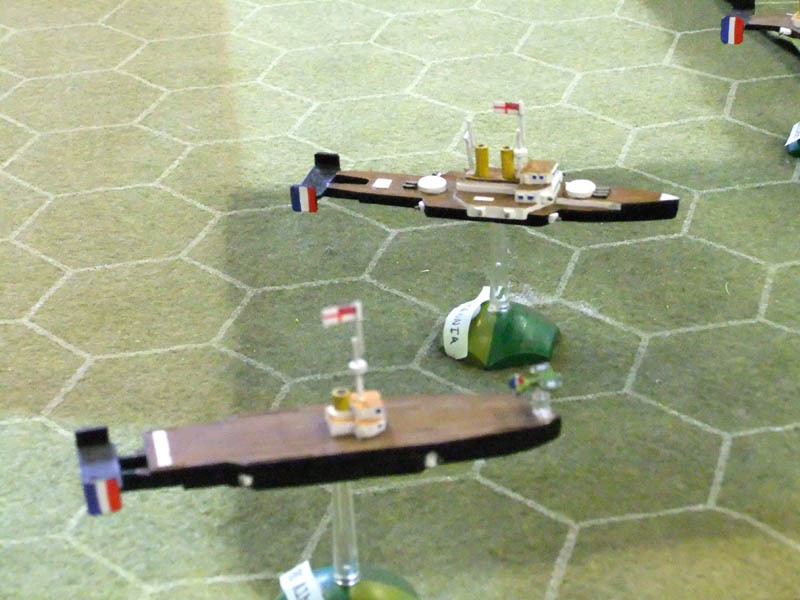 Things got worse for the Germans in that their outlying patrols did not reach the table in time to fully engage the enemy and eventually unsupported but after causing a number of British losses the Blucher went down. 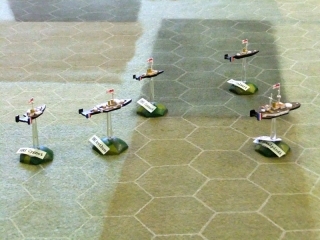 The British decided that 2 out of 3 objectives was a respectable result and headed for home. 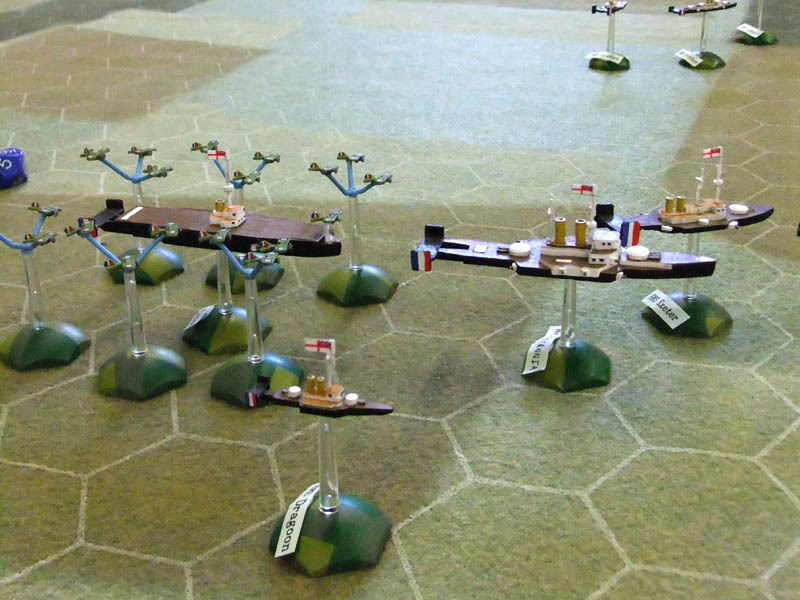 As far as the sceanario goes, I think I should have allowed the German patrols to enter from any side. This would have put them in the middle of the British should they have wanted and would have been in keeping with the idea that this was a strike deep behind enemy lines. I’m not sure it would have altered the result much, but the British may have paid a higher price. As far as the new rules go, I was really pleased. By keeping a simple to hit and damage mechanic the game was very easy to pick up. The special damage table created a little uncertainty and fear and the result “The men are grumbling Sir!” had the most laughs. Apart from a few tweaks, the only real problem was the rules didn’t address nef’s bombing ground targetsh properly and we had to make up some rules on the fly, (but no one noticed). I’m with Baron Ironfist on this one – I’ve read your old posts on TMP, and I’m looking to spice up my ‘Neffies (see what I did there?) while I wait for Imperial Skies to come out. Could you send me the amendments as well, please?